Weddings in Mumbai are always grand and exquisite, so should be the venue. For weddings that are remembered, the venue selection plays an important role. If you too want your wedding to be an outstanding one, make sure that the venue is gorgeous. The picture of the venue will be forever etched in the minds of your guests and I bet you would want it to be an exclusive one. These are some of the best 5 Star wedding venues in Mumbai with exquisite décor in classy tones that can be decorated to suit any grand wedding. Venues with poolside, terrace area, rooms and suites with top class luxuries and architectures inspired by the British, you name it they have it. With world-class dining, landscaped gardens and waterfall adorning your nights, The Leela is one of the finest 5-star hotels in the city. It has an unmatched legacy of hospitality and is a tranquil oasis of landscaped gardens set amidst the hustle-bustle of Mumbai's busy Sahar area. The hotel is geared to handle weddings with up to 1,000 guests. Treat your guests with a royal feast of multi-cuisine delicacies to choose from in both vegetarian and non-vegetarian food. The decor team at Leela Banquet Hall takes care of the decoration for your big day. The venue allows you to get your own decorator from outside to decorate the venue as per your requirements. One of the oldest names in the field of hospitality Ramada Plaza Palm Grove, Juhu stands proud along Juhu Beach with gorgeous views of the Arabian Sea. Whether you choose the banquet hall for your reception or wedding or the outdoor garden area for a small sangeet or mehendi ceremony, the staff at Ramada is equipped to take care of your event needs. Ideal for social events, private meetings and conferences, it has well-facilitated arrangements and offers banquet halls for hosting pre-wedding and wedding ceremonies. Novotel Mumbai Juhu Beach, Juhu, Mumbai has a gorgeous poolside lawn area that looks out to the Arabian Sea. It offers sunset view from the lawn which is known to be spectacular. Imagine taking your wedding vows against the backdrop of a sky painted in shades of pinks, oranges and violets. Novotel Mumbai Juhu Beach, Juhu, Mumbai, offer even a separate entry available at the venue for baraatis. Prefer an indoor function? The Champagne Ballroom at Novotel, Juhu combines the best of modern technology, contemporary décor and classic luxury to give you an unforgettable experience. 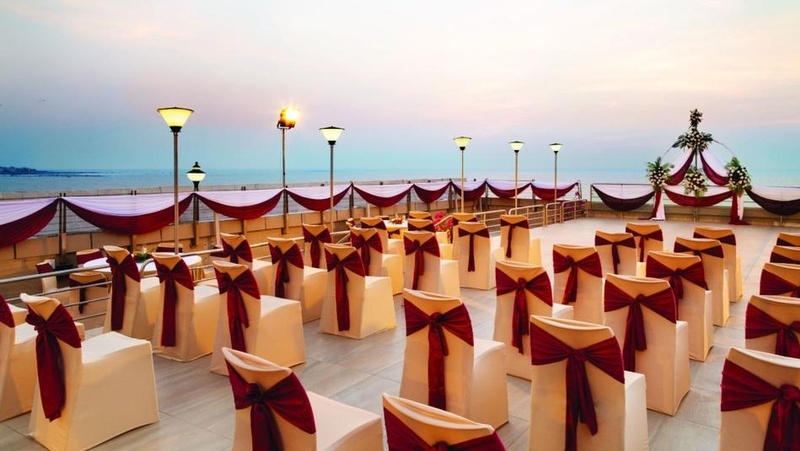 Novotel Juhu Banquet Hall and their pool side party area are sure to spoil you for choice! Courtyard by Marriott, Andheri East, Mumbai, offers both luxury and convenience for its patrons. The hotel is known for its catering services and event venues. From the 25-feet ceiling Amber with its dramatic pillar-like chandeliers to the sprawling garden area that's perfect for those cozy winter weddings; this venue continues to amuse one and all! Courtyard by Marriott also has its own on-site planners to make your event a phenomenal success. With spacious banquet halls and impeccable service, this venue is sure to be a success among your guests. Holiday Inn, Andheri East, Mumbai, is among the finest luxury hotels, which is perfectly connected to the rest of the city via the Western Express Highway. Holiday Inn Banquet Hall, makes it a preferred location for your event. If you have outstation guests, Holiday Inn Mumbai proximity to the airport will make it convenient for them. Holiday Inn, Mumbai Banquet Hall has breath-taking high ceilings in the opulent ballroom will lend an air of majesty to your special day. The rich red carpeting, sparkling crystal chandeliers and floor-to-ceiling dark wooden doors at Holiday Inn, Andheri East, Mumbai only add to the appeal. Want to take your party outdoors? Choose the beautiful open-air terrace area at Holiday Inn Andheri which is surrounded by greenery, where your guests can have an alfresco dinner under the twinkling night sky.